At least 228 cases of measles have been reported in the US this year, and that figure is steadily rising, the CDC warned today. Last year, there were 372 cases in total. But within little over two months, 2019 has nearly eclipsed that figure, with another 22 cases reported in the last week. Now, 12 states have outbreaks, with New Hampshire joining the list in March with one case. Washington state, which has the most cases, did not add any more to its tally, staying at 75. The other affected states are California, Colorado (one case), Connecticut (two), Georgia (three), Illinois (five), Kentucky (one), New Jersey (four), New York (158 since October), Oregon (six), and Texas (11). The weekly update, published today on the CDC’s website, came just hours before it emerged that people in LAX airport may have been exposed to measles in late February. A passenger who had been diagnosed with measles had a layover at the airport on February 21. They were in both Terminal B and Delta Terminal 3 between 9am and 9pm that day, prompting fears of more cases in California – a state which suffered a severe outbreak in 2014. The virus’s quick resurgence in the US and around the world has panicked health officials. In 2000, the CDC said the virus had been eliminated in the US. Less than 20 years later, that’s not the case. Globally, cases of measles soared 300 percent last year. Dr Robert Jacobson, an infectious disease specialist at the Mayo Clinic, says all of the outbreaks since 2000 have come from travelers, returning from a country where measles is still common, then interacting with an unvaccinated community in the US. ‘We are dependent on the baccine to keep us protected,’ Dr Jacobson said. ‘Even if you don’t hear of [measles infections] often,’ that does not mean you will not come into contact with it,’ he said. Dr Jacobson, like many others in medicine, sees the power of the measles vaccine at the heart of the anti-vaxxer movement. Once the vaccine was rolled out, measles rates plummeted, and the virus was eventually eliminated in the US. That sewed a false sense of security. The vaccine-skeptical non-profit National Vaccine Information Center slams this kind of take, saying the choice to forego vaccines is a human right. But Dr Jacobson says there is no grey area: the measles vaccine saves lives. 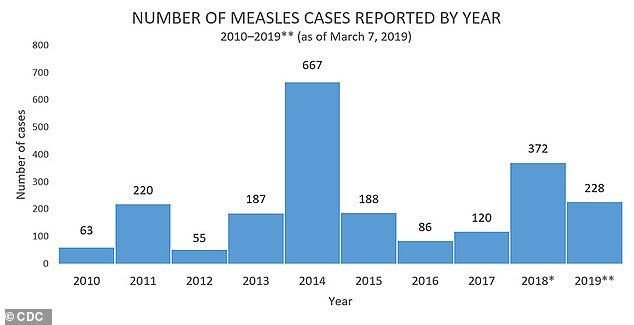 And not only from measles itself. ‘We have discovered that measles leaves your body immune-suppressed for a year or two afterwards,’ Dr Jacobson said. ‘When we introduced the measles vaccine to areas of the world where the children had not previously been vaccinated, we not only saw a reduction in deaths from measles, we saw them with other diseases too in a year or two afterwards. It’s still not clear how measles behaves to suppress the immune system, but Dr Jacobson said he was not surprised by the findings. Dr Anthony Fauci, head of infectious diseases at the National Institutes of Health (NIH) sighed when asked about reluctance to vaccinate. The NIH is pouring efforts and funds into designing a vaccine to protect people from the notoriously elusive flu, which mutates every year as it moves from humans to migrating birds and back again. ‘Everyone should be vaccinated. Period,’ Dr Fauci said.